The second full length CD from Norway's Hades is certainly a good one. The guitars are suprisingly warm and the constant fuzz from the distortion makes them sound awesome. The acoustic parts are well written and seem like a real asset to the song instead of just being there to fill the trend requirements. Better than average vocals and keyboard parts that are not completely annoying add to my enjoyment. Hades has a definite song writing style and recognizable sound, which I like to hear in any band. 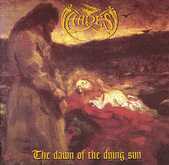 My favourite tracks include "The Dawn Of The Dying Sun", "Alone Walkying" and "The Red Sun Mocks My Sadness". The only criticism I have is that the drums are slower on this album than on the last. Good sound quality (as expected from Full Moon Productions) is also a big plus for this band. Not the normal "Viking Metal" crap, Hades builds a mood with slower songs, which can range between four and ten minutes in length.